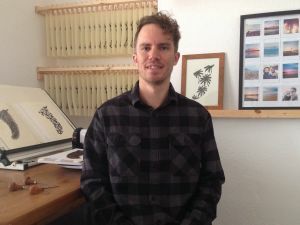 Hi, I’m Tom Metcalf and I’m the artist behind Carve Fin Art, a series of linocut surf fin art prints. 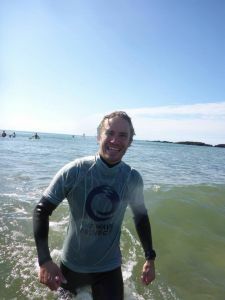 I’ve been volunteering with The Wave Project at Bigbury Beach in South Devon and I’ve also run the Great West Run (while carrying a surfboard the whole way! ), to raise money for this amazing charity. In early 2015, I had a pretty serious breakdown while at work, which resulted in my employer taking me straight to hospital. It wasn’t the first time that I’d reached this point, but while I was sat in the hospital room being assessed by the mental health practitioner, amongst many other things, we talked about what it was that kept leading me back to this point. In the months that followed I thought a lot about what we’d discussed in that room and how I could try and break this recurring cycle of mental health breakdowns that I’d struggled with since my early 20s (I was now in my mid 30s). These were breakdowns that had cost me countless relationships, jobs, a business (when I was forced to go bankrupt due to one) and on a number of occasions, almost my life. Although this was far from being my first breakdown, it was the first time that I’d actually accepted that I had issues with my mental health that really needed addressing. That might sound strange (especially coming from someone who’d suffered from recurrent major depressive episodes for over a decade), but generally once the dark storms had passed and I was climbing out the other side of depression, it was very easy to pretend that nothing had happened and just carry on with life as usual. In fact, I’d say that it’s actually far more tempting, as I didn’t have to think about or process how bad I was actually feeling while I was at my worst (which was pretty painful to deal with) and as they say, ignorance is bliss. The problem with this view of things, is that you’re often then totally ignoring what’s caused you to get to that point in the first place, like I’d done previously, which is why I kept on ending up back there. This time I wanted to approach it differently, more openly and honestly, especially with myself, but also with those around me too. I had to admit that there was a real problem and actually give myself time to heal, rather than just putting a brave face on it and pretending everything was alright…until the next time it reared its ugly head. I also, when I felt well enough, tried to spend as much time as possible doing the things that I loved and made me feel the most alive. For me, this was spending time on the water, kitesurfing and surfing. When I was in the grips of depression, it felt as though I became disconnected from everything and I was somehow lost in space and time, so to me, there was no better feeling than being totally connected with my environment in that moment, powered by the wind and the waves. This tied in with a course of mindfulness based cognitive therapy I was sent on as part of my recovery too. 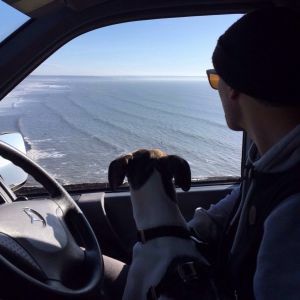 A few months later, with my new found acceptance of the difficulties with my mental health and this passion for being on the water, I began to look in to opportunities where I could possibly combine my understanding of these two things and that’s when I found The Wave Project, while searching on the internet one day. It sounded perfect from what I saw on the website, so I got in contact right away and I was in luck, as a local course in Bigbury had just recently started, so I was able to go along and get involved with that. As the sessions went on, I loved how you could literally see the changes in the young people we were assisting, as their confidence was building and they learned to find their feet while surfing. You could almost see the moment when it was like a weight had been lifted off them, as they forgot about everything else going on in their lives and their smiles would suddenly start to shine through. It was around this time that I was also volunteering with another awesome local organisation, The Project, which was also helping young people who were experiencing difficulties with their mental health. It was while I was there that art would re-enter my life (having pretty much given it up at school, after letting judgements and comparisons ruin my enjoyment of it) and surfing and art met in a way that has led me to where I am today. We would take part in different activities while we were there and one evening, during one of the sessions, we were given some white card and a piece of charcoal. We were told to just make marks on the card and experiment with different actions and motions, without any intentions behind actually creating anything in particular or involving any thoughts. Parts of what I created looked like flowing waves and I really enjoyed being artistic again and with what I’d learned on my mindfulness course, I finally let go of the judgements I had about my art when I was in school, all those years previously. Soon after this, I visited a small local art gallery, where I saw some beautiful pastel artwork. I was really inspired by it and I could see some similarities between the look of the pastel work and the drawing I’d created with the charcoal, so I decided that I wanted to give it a go. Luckily, my girlfriend had some old art supplies in a drawer at home that I could use and that’s really where it all began. I remember watching a video on YouTube around that time, about a guy who’d created a drawing a day for a year and how it had changed his life, so I thought I’d try that myself. I didn’t make it to a year, but I did go on to create a picture a day for 125 days and my passion for creating surf art firmly found its feet during this time. My first pictures (which I still have tucked away in a drawer somewhere) were drawn using pastels and were often recreations of some of my favourite surfing photos, but as I gained in skill and confidence, I started to try out different mediums and styles, as well as beginning to experiment with my own compositions too. 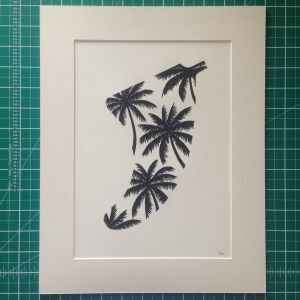 This included some marker pen drawings, that really sparked my interest in creating bold and striking black and white designs, a style which I’d later go on to explore more and develop, as I discovered linocutting. I also created pieces with biro, posca pens, acrylics, watercolour paints, fine liners (for intricate dotworks), as well as moving on to experimenting with digital design too. 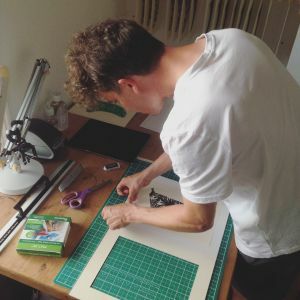 It was during this journey of exploration into creating art, inspired by some of of my previous drawings, along with other artworks I’d seen on the internet and social media, that I decided to buy a cheap linocutting set and give that a go too. I fell in love with it almost immediately and it quickly became my main focus artistically as a result. I loved the process, right through from designing the images, to carving them into the lino and then finally inking up and printing the image. It was that magical moment of lifting the paper and turning it over to reveal the result of what you’d been working on, something I still love each time I pull a new design from the lino. 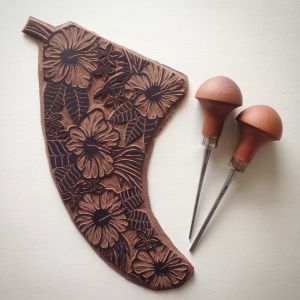 After carving and printing a few wave designs, I was hooked and I soon upgraded my linocutting tools and materials, which allowed me to try out more intricate designs. 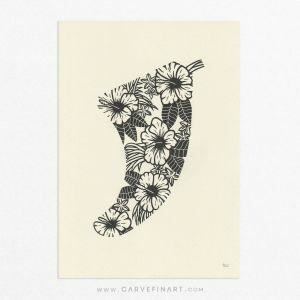 Then came my first fin print and that’s what paved the way for the start of Carve Fin Art, my series of linocut surf fin art prints, as one fin led to another, and another, and another. 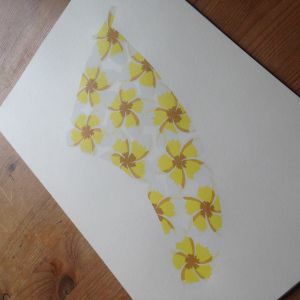 As well as enjoying cutting and printing these, they also began to take on their own symbolic meaning too, as I thought more deeply about the fin shape and its purpose on a surfboard. The fin is part of the surfboard that gives the surfer a greater sense of control and connection to the wave, allowing them to control speed and create drive and I loved how this tied in with what art meant to me and how it had given me a better sense of control and direction in my life too. I also began printing my fins at a slight upwards angle, another little intentional hidden meaning, meant as a reminder to keep looking up and moving forwards. And that’s just what I have done, having gone on to complete my first series of linocut surf fin designs in black ink, before now having moved on to a new collection of colour linocut fins, which I’m currently still working on. That brings my story right up to the present day, so thank you for taking the time to read it and I hope that you’ve found it interesting following my journey through the last 3 years, from a time when I saw no future, to the point where I am now, where I’m trying to use what I learnt, to create a better future for myself and those around me. 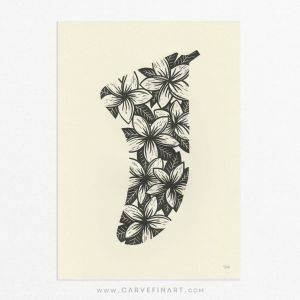 You can see my full range of linocut surf fin art prints, which are all available through my website, via the following link https://www.carvefinart.com/surf/WaveProject. If you visit my site via that link and then go on to buy one (or more) of my prints from my online store, I’ll then give 40% of the proceeds from that sale to the Wave Project, as a thank you for their part in helping me along this path to finding myself as a surf artist and so that they can continue to do the awesome work they do. Not only that, but as a thank you for reading this piece and taking an interest in my journey, if you use the coupon code ‘waveproject’ at the checkout, you’ll also save yourself 10% on the cost of any prints you buy. 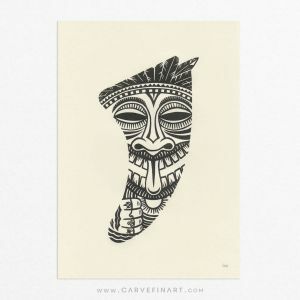 Click on the following link https://www.carvefinart.com/surf/WaveProject to visit the Carve Fin Art website and take a look at my Linocut Surf Fin Art Prints now.